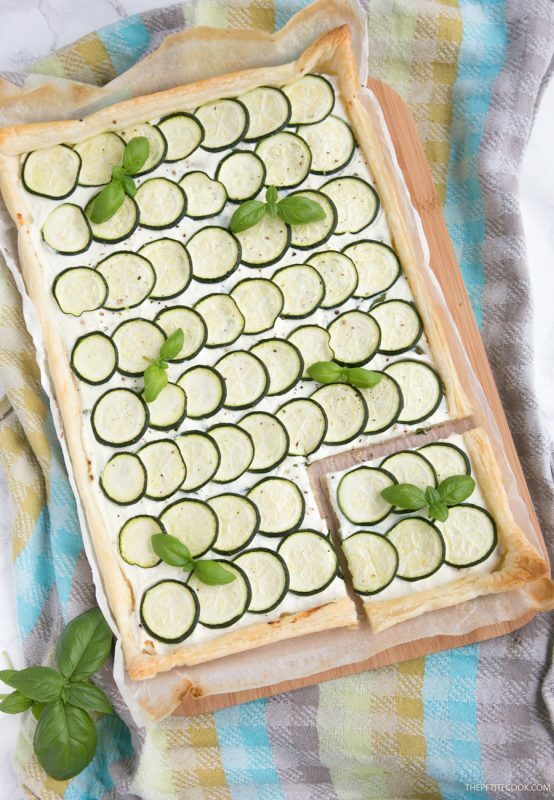 This rustic Zucchini Tart with Ricotta and Fresh Herbs makes a tasty vegetarian meal for any occasion – The perfect addition to any summer table! 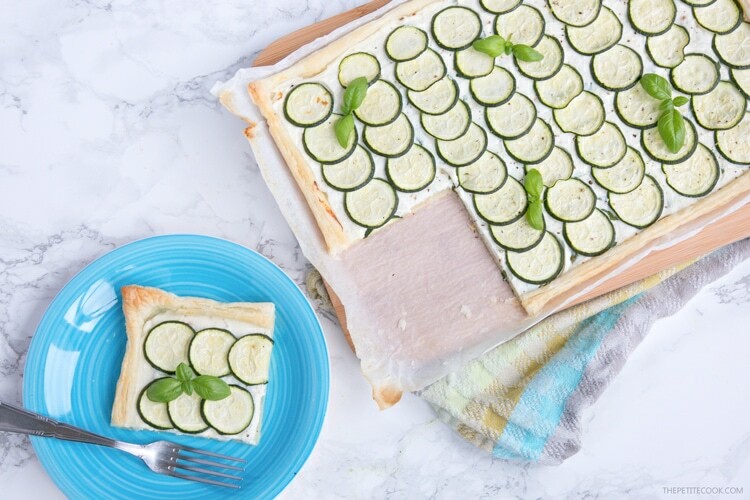 One of my favorite summer recipes, this tart is a wonderful picnic, party or bbq addition- Simple to make, bursting with seasonal flavors, I often prepare this tart whenever I find fresh zucchini at my local farmer’s market. 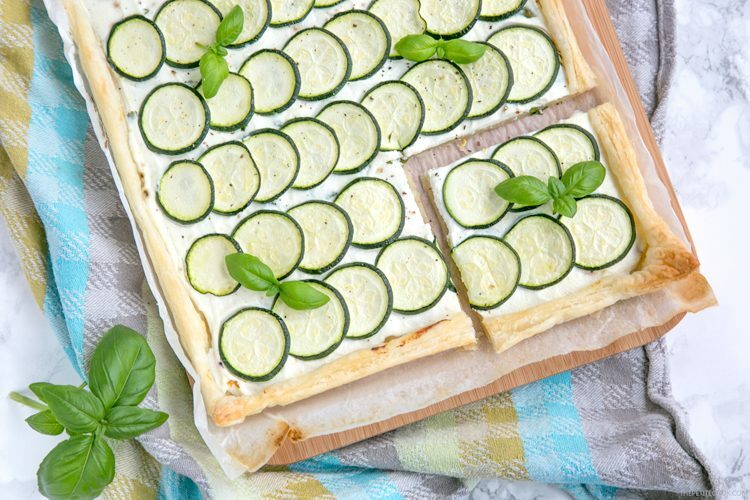 Ready in less than 30 mins, packed with fresh wholesome produce, to make this Zucchini Tart all you need is 5 ingredients: fresh zucchini, organic ricotta cheese, a bunch of fresh aromatic herbs such as basil and thyme, a sheet of puff pastry and the zest of one organic lemon ( the unwaxed ones). 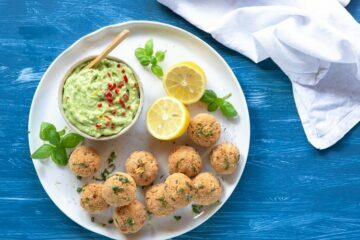 You may also add into the ricotta mix a fresh mozzarella ball cut into cubes, but for a lighter version feel free to leave that out. The smart ricotta tart base is great topped with any seasonal veggies. One of my all-time favourite way to use this base is this asparagus version, it makes regular appearance at our family table on springtime, when asparagus are at their best here in UK. Easy to put together, this Zucchini Tart requires very minimum efforts, and it’s quick and fun to put together. All you have to do is mix the ricotta with herbs and lemon zest, seasoning well with sea salt and black pepper. Then, to make sure your puff pastry is evenly cooked, bake the base for 15 mins before adding the rest of the ingredients. At this point, you can evenly spread your ricotta cheese mixture on the tart, top it with sliced zucchini, and put it back in the oven for an extra 10 mins. I use a 9 x 13-inch baking tray, but you can cut the pastry edges and make it round if you like. Once the Zucchini Tart is cooked through and golden-brown, remove from the oven, and allow to cool slightly. Top with extra basil leaves and drizzle with extra-virgin olive oil, then served your awesome tart warm, cold or at room temperature. 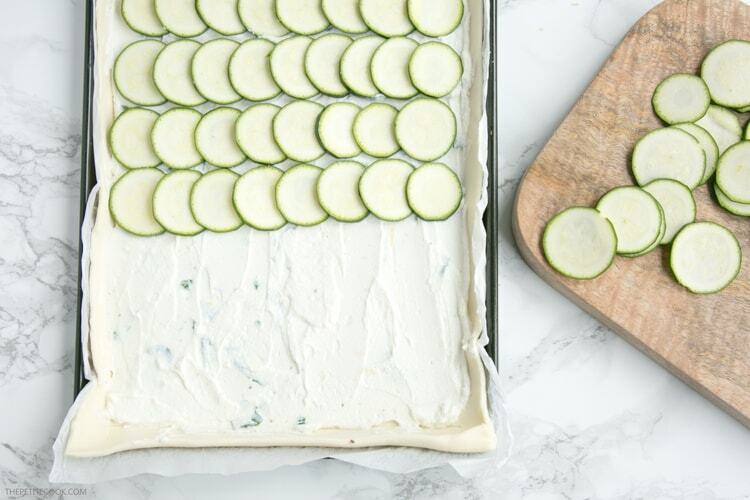 Easy and quick to put together, this vibrant Zucchini tart is a fantastic addition to any summer barbecue, party, brunch or picnic! 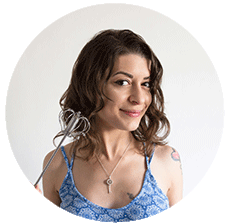 I really hope you give this light Zucchini Tart a try. If you do, make sure to comment here below and share with me your favorite veggies to use. Don’t forget to snap a picture, tag it #thepetitecook and share it with me and all your friends on Instagram! This rustic Zucchini Tart makes a tasty vegetarian side or main dish - The perfect addition to any summer table! Roll out the pastry to about 6 x13inch (15 x 17cm) rectangular shape and trim the edges. Transfer to a baking tray covered with parchment. Score a 1cm border, making sure you don’t cut the base. Prick the base with a fork, brush the tart edges of the olive oil. Bake for 15 min, in the oven middle rack. Meanwhile, prepare the cheese filling. 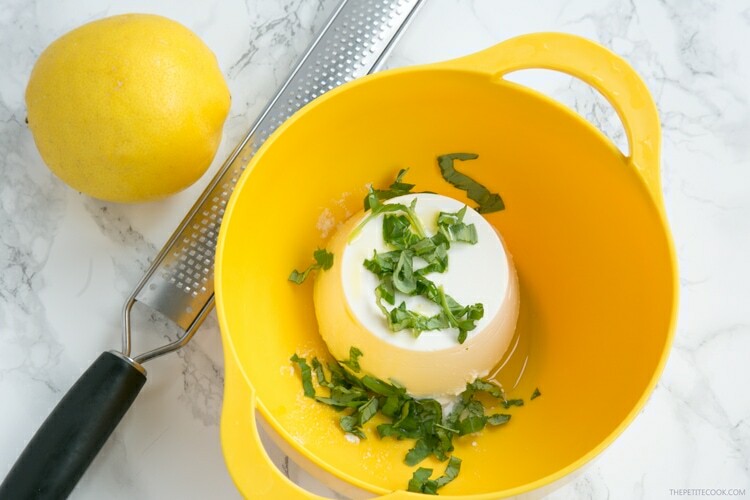 In a bowl mix the ricotta, lemon zest, herbs and the mozzarella if using. Drizzle with very little olive oil and season with salt and freshly cracked black pepper. Remove the base from the oven and evenly spread with cheese mixture within the borders. 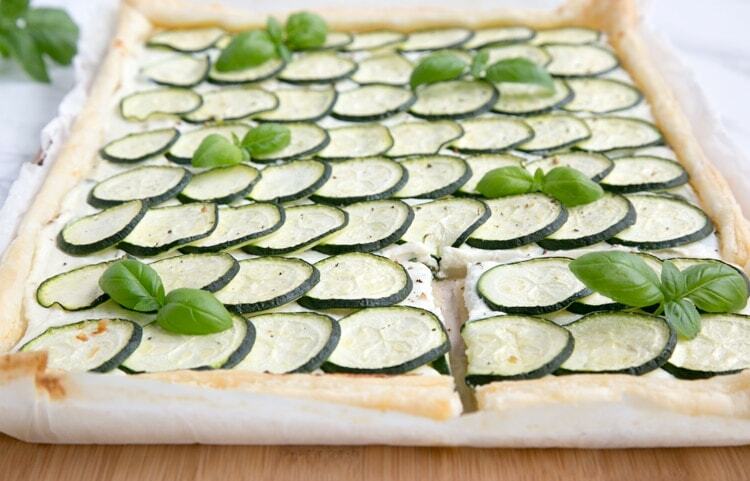 Place zucchini slices along length of the tart. Drizzle with a glug of olive oil, season with sea salt and black pepper and bake for 10 mins more. Remove from the oven and allow to cool slightly. Serve warm or chilled. 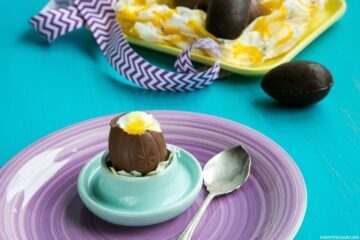 Refrigerate in an airtight container for up to 2 days. Enjoy! For a 100% vegetarian version of this tart, make sure you buy a dairy-free store-bought puff pastry. Or even better, make your own puff pastry. I always use Gordon Ramsay’s rough-puff pastry recipe, it’s quick and easy to prepare. 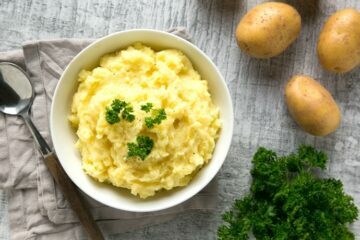 All you have to do is substitute butter with margarine or a vegan alternative. 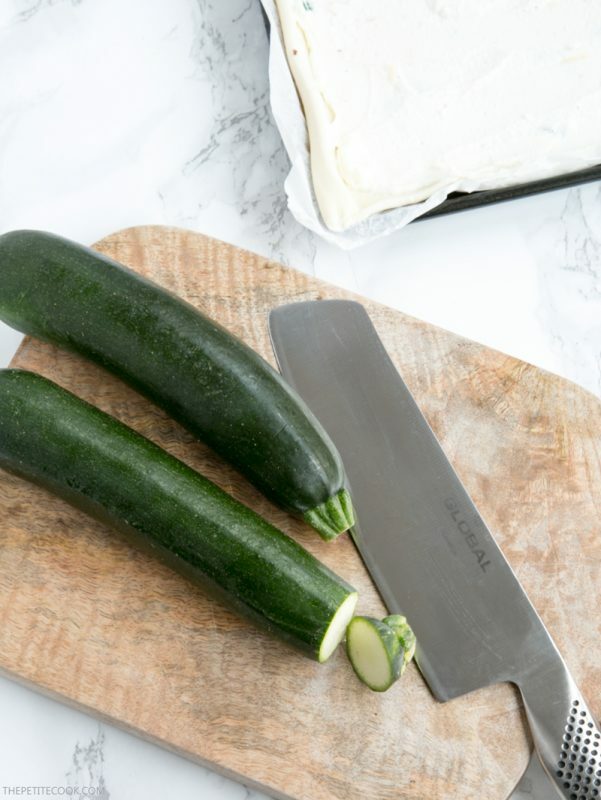 This recipe will be getting logs of hits for people whose gardens are providing them with an overabundance of zucchini this summer. This one is unique and it;s like no zucchini recipe that I have seen before. Thank you for such a creative way to use up some of my summer’s harvest. Thank you so much Patti :)! I love zucchini, they’re so versatile you can make all sorts of recipes, from savoury to sweet ones. It’s a win-win!